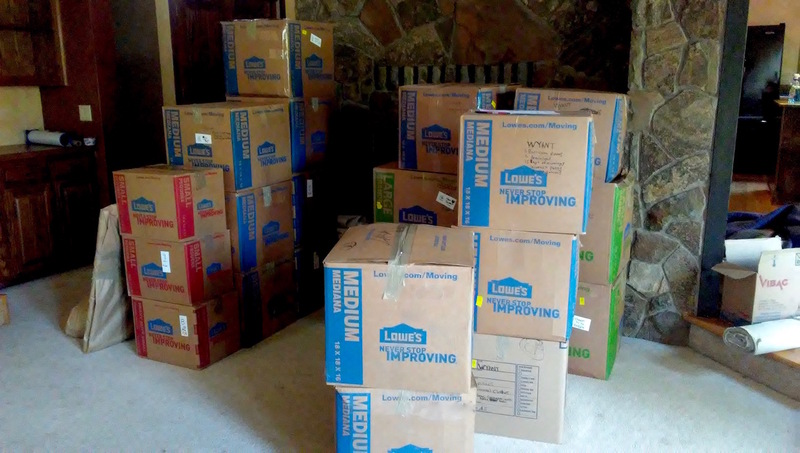 Due to a hot housing market, we faced down the challenge of downsizing our 2400 sq ft home to the few boxes we’re bringing to Spain in 30 days. It was hard. Being retired means you have no schedules – no starting time, no quitting time. So, what did we do during our first month of retirement? We worked. From predawn to dusk and beyond. But, I’m getting ahead of myself. Let me back up to July 1st. Our best laid plan was to take a nice leisurely summer to sell our home, eliminate our possessions, travel a little, enjoy our retirement, and ready ourselves for our move to Spain in September or maybe October. Heck we even thought we’d visit my brother Mike in Colorado. All those gentle plans went out the window when the timespan between my first day of retirement and our empty house dropped to 30 days. We’d put the house on the market in early June thinking that we might need the summer to get it sold. We hadn’t even been to the Spanish consulate to apply for our visa – that wouldn’t happen until June 26. Turns out the house sold in a day and the closing was set for July 31. With a new timeline, we had to put it in second gear. Or maybe overdrive. We still took one day to celebrate my retirement with a Ben Rice concert at Erath Winery and dinner at La Rambia. But that was it. When Jamie’s 65th birthday rolled around a week later we just plowed on through without pause. Moves are always hectic, even when they are local. Timing is a little more critical when moving across country. Timing when moving across the country AND then overseas is difficult beyond what I imagined. The difficulty was compounded because we were eliminating the vast majority of our personal possessions. In hindsight, when people said, ”I can’t imagine doing what you are doing,” I think they were more in touch with reality than I was. THEN ADD IN FIVE PETS to swell the complexity exponentially. Many people can find temporary housing for a month or so when faced with a situation like ours. With five pets, that would have been nearly impossible for us. Thankfully, Jamie’s sister, Jill, came to our rescue. But she lives in Wisconsin. Not exactly down the street. We didn’t have much time to accomplish our chock full agenda, so we put our heads down and pushed on. Once we made application for the Spanish visa, we knew we needed to find a flat in Spain. Every morning began with coffee and a scan of Idealista.com, a website for Spanish home rentals. We would identify prospective places and send them to Linda, our relocation specialist with the business, Moving to Valencia, to check out. After a couple of weeks we closed in on a flat, wired a deposit, and began negotiations. That day deserved and got a much needed celebratory lunch. I should have reduced my four drawer steel file cabinet to weightless pdf’s years ago. Culling our possessions meant selling furniture on Offer Up, LetGo, and Craig’s List, two days of garage sales, renting a U-Haul truck for multiple trips to charity shops and much as I hated it, making garbage. Thankfully, along the way we were able to bless people with things of meaning from our life that we hope they will enjoy for years to come. Our 2,400 square foot house with a tool-packed garage was reduced to my minimalist dream. 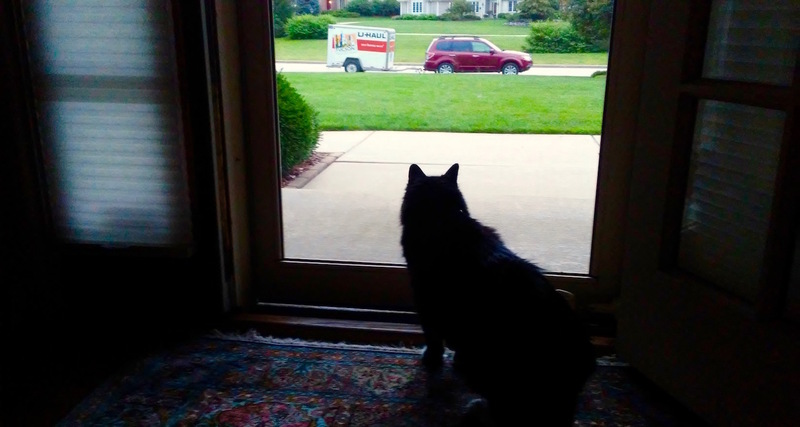 We practiced car trips and leash work with the cats in preparation for our cross-country drive from Oregon to Wisconsin. And we plotted our trip for four 10-hour driving days. Optimistically it turned out. And we made reservations in advance (thank you La Quinta for being pet friendly, not just dog friendly). For this trip, we put new tires on the Subaru, had a tow hitch installed, and rented a U-Haul trailer to transport personal artwork to family for long-term safekeeping. During July we couldn’t escape Spanish bureaucracy. Our residence visas were approved in 13 day which meant we had to make a California trip , both of us, in-person, to present our passports for the ten-minute process of adding the visado. But before that the consulate wanted us to arrange and book our travel to Spain and organize air transport for the pets. Yet another non-simple task. The weight of all the decisions felt crushing on some days – much more than the actual work. Fortunately, we noticed that once several preliminary decisions were made – where we will be living and how the apartment was furnished for instance – the rest of the pieces started to fit into place. Much like decorating a room, when you narrow down all your choices to that first color, you can finally zero in on your scheme. Each morning one of us would say, “I think we’re on schedule, how do you feel?” The answer would either put us in overdrive or allow us to sleep a few minutes longer. Then there was time we needed to spend on other important things, including many goodbye’s over meals and walks, by phone, and, believe it or not, during the garage sales. We selected and applied for a travel credit card appropriate for international living. I sent my bike to the shop for new shifters so it would be ready to hit the roads when we arrive. I had my pearls restrung. I tried to rollover my 401(k). Not sure what’s going on there. There was a little flurry at the end. On the day the movers came and the house changed hands, I felt I was doing the work of four Merry Maids. And I was missing our Oregon friends. But my former co-workers brought over lunch and that little gesture meant the world to me. The day wore on and we discovered the Spain shipment wouldn’t hold everything we planned to send. Fortunately, we’d parceled out a few things to friends, to the buyers of our house, and loaded the rest into the U-Haul for purging in Wisconsin. When you’re down to the last 30 minutes what are you going to do? Jamie’s response was to shove stuff into the nooks of the already well-packed trailer. We even transported the extra boxes only to recycle them clear across country. Right now, we’re just glad we have a month to enjoy Wisconsin and two months before our shipment arrives – and needs to be unpacked — in Spain. It’s nice to feel light. Thanks Susan. I’ll keep a close eye on the blog and look forward to your and Jamie’s insights. We wish you the very best of luck in Valencia! I came across this resource, Moving Overseas: The Definitive Guide, written by Mark Nash at UpackWeShip.com. I wish I had read this before we moved. I think you will find it useful. My moving post will be ready in a day or two. I’m so relieved to have stumbled on your blog! Thank you for sharing your experiences. My husband and I are about 12 months behind you. We’re preparing to move to Spain with two beagles and a cat in November. Your posts about transporting your pets are incredibly helpful. I have a question about this post. You mention that you shipped some of your belongings to Spain. Do you mind sharing what company you used, how much it cost, and how much you shipped? If you’ve done a post on this and I just haven’t reached it yet, apologies. I am happy that you have found our blog useful. Jamie and I don’t have any travel adventures scheduled in the next couple months and we plan to write more. Several months’ experience here in Spain and our move within Valencia have consolidated our thinking on what we might do differently with regards to shipping, storing and replacing belongings. Jamie already has a rough draft of a blog post started. I’ll get him to finish it soon and let you know when we get it out.